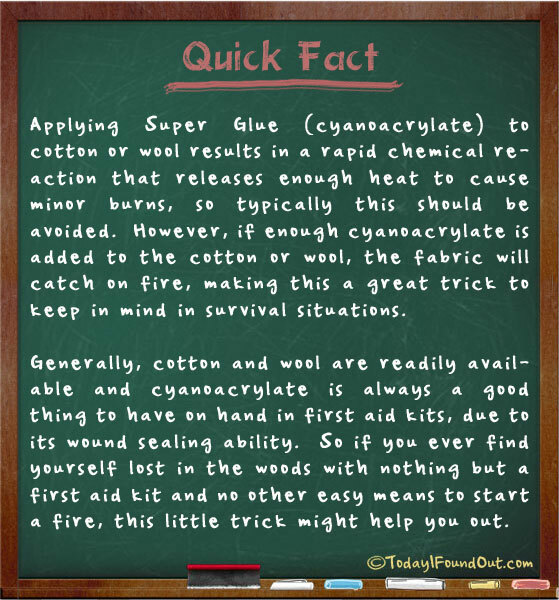 Generally, cotton and wool are readily available and cyanoacrylate is always a good thing to have on hand in first aid kits, due to its wound sealing ability. So if you ever find yourself lost in the woods with nothing but a first aid kit and no other easy means to start a fire, this little trick might help you out. Yeah I had a bottle of super glue come into contact with my fleece hoodie. And smoke was plumeing out. Was right in my face, I couldn’t scream the smoke was choking me, and my eyes were burning badly. I don’t ever recommend letting super glue touch anything cotton. The process releases cyanoacetate and formaldehyde – both irritants to the eyes, nose, throat and lungs. Derma+flex, SurgiSeal, FloraSeal and Dermabond cause less skin irritation and offer increased flexibility and strength compared to traditional ‘Super Glue’. In 1998 2-octyl cyanoacrylate for the closure of wounds and surgical incision and in 2001 was approved as “barrier against common bacterial microbes including certain staphylococci, pseudomonads, and Escherichia coli”. These do not have exothermic qualities and as a consequence do not harm tissue the way superglue does. It should be written there on glue itself. In my case I wiped drop of glue with tissue paper and it started smoking. Yup, learnt the hard way too. Tube split, landed on my tights, burnt my leg and the fumes on the smoke burnt my eyes. I’m now feeling very sorry for myself. I was repairing a hole in a pair of jeans….I put duct tape on the back side and used that to hold the fibers in place covering the hole…..I put the super glue on and it got real hot…..I thought it was due to the reaction with the adhesive on the duct tape….Also here is a trick when using super glue….if you put Baking Soda on the super glue it will react and dry right away and form a stronger bond……USE BAKING SODA with super glue to make stronger bond and to dry glu faster…..
Superglue on clean white pipe cleaners is used by investigators to develop latent fingerprints. The pipe cleaner (cotton) is poked thru the bottom of an upside-down styrofoam cup. The styrofoam plays no chemical part in this, it’s just easy to work with. Tip the cup upright and squeeze some superglue onto the pipe cleaner, then place the cup upside down again over the latent fingerprints. DON’T BREATHE THE FUMES. They contain cyanide and formaldehyde and will spoil your day or kill your pet bird (don’t ask me how I know that). Leave the cup over the latent prints for a minute then remove, again being cautious with the released fumes. Your prints will be developed in hard purple ridges. Take ECU photographs of the prints, then dust them and press evidence tape over them to collect the dust. Press the tape onto clean white paper and your prints are preserved. If there’s a way to remove the hard purple ridges from the original surface, I haven’t found it yet. Some say nail polish remover works but it didn’t for me. Well I crazy glued a needle with thread to my finger on accident. I was trying to open the little hole in the crazy glue with the needle but the needle got crazy glued to my finger. The thread also got clues to my finger causing a heat. man it burned me but left no scar. I was so confused on what caused all that heat! Now here I am on this page!! I didn’t even know that was possible. Mind blowed!!!! I dripped some super glue on my carpet and it started smoking. I was freaked out thinking the carpet would burn on fire. I put some water on it and it instantly solidified. Very weird things super glue can do these days! I was burned by it so thank you!! !